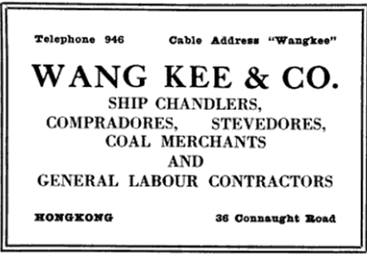 Founded in 1905, Wang Kee& Co (“宏記公司” or “宏記辦館” which means Wang Kee Provisions) was a dominant player in the port of Hong Kong acting as stevedores, shipchandlers, transporters and general labor contractors supplying Chinese crew, provisions, harbor pilots (a business which it once monopolized) and warehouses to ships coming in from all over the worldwith its own Wang Kee Buildingat 34-37 Connaught Road Central and fleet of tugboats, lighters and cargo ships. After the rise of containerization in the early 1970s, Wang Kee remains a major logistics service provider and one of the key labor contractors to the container terminals. Wang Kee was founded in 1905. The founder was likely the father of the Yeung brothers who ran the firm from the 1930s to the 1960s. (Any info about the founder of the firm is much appreciated) While the firm ended up providing a wide range of shipping-related services, its original business was in provisions and one of its early employees was Law Wing-cheung (羅永祥), who introduced his friend Lai Man-wai, the head of a local acting troupe, to Benjamin Brodsky, a Russian American filmmaker who came to HK to make movies on a ship which Wang Kee provided provisions for in 1914. Together, Lai and Brodsky made the first dramatic film produced in Hong Kong – “Chuang Chi Tests His Wife”(莊子試妻)and launched the HK film industry. Wong Tai-chiu (黃大釗), the labor union leader and director of the pro-Beijing Chinese General Chamber of Commerce, also worked as a foreman for Wang Kee in his younger days in the early 1920s. In the 1910s, Wang Kee entered the highly lucrative and exclusive business of harbor piloting. According to a 1964 article in Nanyang Siang Pau which discussed the evolution of harbor pilots in HK at length, the business traced its origins to the 1880s when foreign vessels which almost got into accidents in HK harbors enlisted the service of fishermen in Lei Yue Mun to help them navigate the treacherous local waters. By the 1900s, the colonial government began proper licensing of harbor pilots which required two years of apprenticeship and passing exams. In 1926, Wang Kee was listed as one of two firms (the other being Sing Kee & Co at 24A, Connaught Road) authorized by the Harbor Master (G.F. Hole) to provide harbor pilots but attracted by profits, the number of players increased to five at its peak before the War. The Comacrib Directory in 1925 shows Kwok Too was managing partner of Wang Kee and assisted by Leung Yew(梁耀), who was a key figure at the firm for decades. A native of Panyu, Leung Yew was a graduate of Queen’s College and was appointed Justice of the Peace in 1947 alongside Chow Yat-kwong of China Emporium (son of Sir Shouson Chow) and the judge Lo Hin-shing. In 1961, Leung was the biggest donor to the construction of the Memorial Hall at his alma mater Queen’s College with a donation of HK$50,000, a very sizeable amount at the time. Aside from Wang Kee, he formed Leung Yew Ltd (耀和有限公司) in 1948 which imported rice, metal, textile, foodstuffs, stretch yarn, braids, synthetic yarn, nylon goods, machinery, knitted wears, sundries, etc and exported rattan furniture, plastic flowers, toys, gloves, knitted wears, hosiery garments, shirts, watchbands and all kinds of H.K. manufactured goods. The firm was incorporated in 1959 and operated out of Wang Kee Building in Central for many years. By the 1930s, Yeung Yam-hoo (楊蔭浩, 1900-1967) had assumed the leadership of Wang Kee. A native of Panyu, Yeung Yam-hoo learned English at St Paul’s College in HK and started from the bottom at the firm. 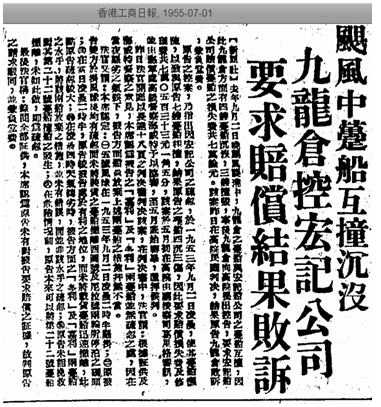 According to a Ta Kung Pao article published during the 1967 riots that was high critical of the Wang Kee owners for their tough stand against the unions throughout the years, Yeung was instrumental in breaking up the strike of Chinese crew and stevedores during the Canton-HK Strike of 1925-26 and in return was awarded many contracts by British shipping companies. He was also a member of the Chinese General Chamber of Commerce and Wang Kee as a firm joined the HK General Chamber of Commerce in 1938. 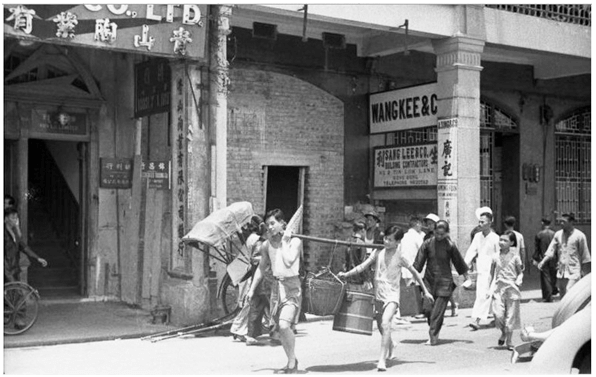 In December 1937, a strange incident took place when someone threw an object into the offices of Wang Kee at 36 Connaught Road while the manager and staff all left to watch a large fire that was taking place across the harbor in Sham Shui Po. The police were called in to investigate but fortunately no damage was done. In 1941, Wang Kee purchased 250,000 dollars worth of war bonds issued by the KMT government in the mainland. 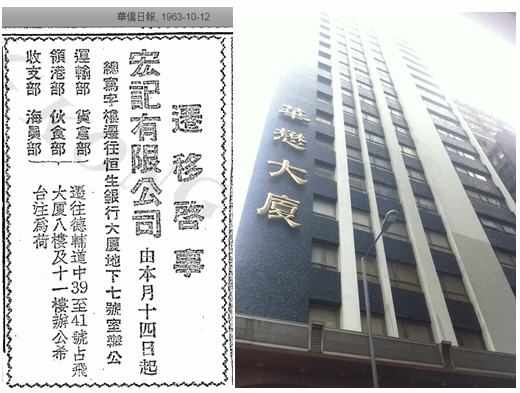 After the War, Wang Kee& Co Ltd was incorporated in 1954 with HK$2.75 million in capital with the three Yeung brothers as subscribers – Yeung Yam-hoo who was living in 56 Macdonnell Road, and his younger brothers Yeung Wing-fai (楊榮輝) at 50 Bonham Road and Yeung Wing-biu (楊榮標) at 4 Kennedy Terrace. Aside from Leung Yew, another non-family director of the firm after the War was Chow Wing-ki (周永基). During the Japanese occupation from 1941 to 1945, Wang Kee’s pilot service were suspended but it is unclear if the firm continued with other services. When the War concluded in 1945, Wang Kee was the only provider of harbor pilots in Hong Kong until Cheung Yu-wing (張雨榮) started his own firm to compete in 1948. After the War, the government imposed stricter regulations in terms of licensing of harbor pilots, with additional requirements such as physical and eye exams, ability to read and write English, a condition that the applicant must be a HK-born resident or UK citizen, and a minimum 3 years working as a sailor on foreign-owned vessels in addition to harbor pilot tests which involved HK and international laws and navigation skills. Given the high bar for qualification, there were only a handful of harbor pilots in HK, making it one of the highest paid jobs in the early 1960s with monthly salary of over HK$5000 which was a huge sum back then. In 1958, the 52 years old Cheung Yu-wing murdered his apprentice Chan Yuen (陳元) who was striking out on his own and was sentenced to death by hanging in 1959, thus eliminating two competitors for Wang Kee. In 1963, there were 17 licensed pilots and 3 apprentice pilots in HK and 9 of these pilots and 2 apprentices were attached to Wang Kee, and the remainder to a competitor by the name ofHarbour Pilot Services. Today, there are 100 licensed harbor pilots in HK handling about 4500 ship movements per month and pilotage is compulsory for all vessels over 3000 gross tons and all vessels over 1000 gt which are carrying dangerous goods. In the 1950s-60s, Wang Kee was also involved in shipping themselves through the establishment of Western Steamship Co Ltd and Eastern Steamship Co Ltd in 1951. In 1951, Western acquired a 3538 ton cargo ship “Empire Jamaica” (built in 1944 in the UK) and renamed it “Westway” and operated it until 1958 when it was sold to Djakarta Lloyd. In 1958, Western acquired a 7201 ton refrigerated cargo ship (originally built in Glasgow for war transport as SS Empire Balfour in 1944) from Houlder and renamed the vessel “Sunlight” which it operated until 1962 when it was sold to Pan-Norse Steamship. Eastern acquired a Tyne built cargo ship by the name of “Kutsang” in 1951 from Indo-China Steam Navigation and operated it until 1955 when it was broken up. Western and Eastern were dissolved in 1963 and 1961 respectively. In 1963-64, Wang Kee re-developed its Connaught Road site (this included 4 properties that were formerly part of the Kung Sheung Daily News office) into a 25 story Grade A commercial building. During the construction, Wang Kee temporarily operated out of the Hang Seng Bank building and Jam Fair building in Central. The construction (and three nearby construction projects by Canton Trust Bank, Chinese Bank and China Underwriters) caused structural damages to nearby old buildings and construction was suspended for months as a result. After the new Wang Kee Building was completed in 1966, tenants which moved in included consulates of Austria, Greece and Singapore and leading shipping companies such as the Fir Lines. By the 1960s, the third-generation members of the Yeung family were getting married and taking over the family business from the second generation. In 1961, the wedding of Yeung Yam-hoo’s fifth son Yeung Ying-cheuk (楊英焯, doctor and HKU MBBS graduate of 1958) to Hui Kwok-chun (許國珍) at the new State Restaurant at the Li Po Chun Chambers was attended by over 1000 guests– including the heads of all the major shipping companies which highlights the importance of Wang Kee in the logistics business at the time. Another son of Yam-hoo – Yeung Ying-yeung (楊英揚, HKU MBBS 1956) was also a doctor and marriedthe fourth daughter of the prominent physician Dr. Arthur Woo Wai-tak. The same year (1961), Yeung Wing-biu’s fifth son Yeung Ying-chan (楊英燦) married Ho Wai-yin (何恵賢), the second daughter of Dragon Seed department store co-founder Ho Sau-hong (何壽康) in another big banquet ceremony. In May 1967, Yeung Yam-hoo died and was succeeded by his son Yeung Ying-yin (楊英賢). Yam-hoo’s eldest daughter Yeung Yin-cho (楊燕初) married Tang Man-wa, the scion of the famous Tang Yuen-cheong family. Sadly, Tang was killed in a racing accident in 1948 as a jockey in Happy Valley. Their daughter Barbara Tang (鄧拱璧) was married to famous actor Kenneth Tsang (曾江) and is currently married to Cantonese opera star Franco Yuen (阮兆輝) while another daughter Doris Tang is married to the museum curator and art historian James Watt Chi-yan. Yam-hoo’s younger brother Yeung Wing-fai died in 1969 and was survived by four sons – including HK swimming champion Yeung Ying-chak (楊英澤) – and four daughters. In the late 1960s, containerization began in Hong Kong and realized the disruption to its traditional business model, Wang Kee began to provide logistics service to the Container Freight Station at the Modern Terminals in Kwai Chung when it opened in 1971. In 1973, Wang Kee (1973) Ltd was organized to focus on logistics service. In June 1993, Emperor International Holdings acquired Wang Kee Building in Central from Wang Kee& Co for HK$650 million. The building was later sold to Chinachem for HK$880 million which renamed it Chinachem Tower. Today, Wang Kee continues to provide logistics service in HK and the Guangzhou Free Trade Zone through its own warehouse at Sun Fung Centre in Kwai Chung and leased warehouse at the Modern Terminals where it remains one of the three leading providers of labor. This article was first posted on 24th September 2018. Any information about these subjects in Hong Kong or about companies involved in them would be very useful. I live in Australia and I have some business cards from Yeung Wing-biu’s that i can send you scans or photos from..
i have very little other information but i found your article very interesting in relation to my Great Grand Father’s business. Andrew – I am so glad that you are reaching out and please send over any pictures/photos you have related to your family to indhhk@gmail.com and Hugh Farmer will help to post them in the article! Hello Mr Lo, i’m Dennis Yeung, one of 楊榮標 (Yeung Wing Biu) grandson. Thank you for the detail article. I have pass it on to my Father and other uncle in 英 generation to share. Thank you very much for contacting the website I started and run. I am happy to hear that you will share York Lo’s article about Wang Kee & Company with your father and relatives. If you are able to provide further information about or images of Wang Kee I would be very pleased to post them on this website. Let me know if you would like to directly contact York Lo. Will certainly do should i discovered more, thanks again. I look forward to seeing any further information and/or images you discover about Wang Kee.